Jesse (Ethan Hawke) is an American travelling through Europe. On a train to Vienna, Austria, he meets a young French woman named Céline (Julie Delpyi). The two hit it off and decide to spend the day together in Vienna before Jesse catches a flight back to the U.S. the next morning. Richard Linklater has become a director who makes bold attempts at film making using time as his canvas. Before "Boyhood," the film that notoriously took 12 years to make, there was "Before Sunrise," a romance about two people from different parts of the world who, in a serendipitous moment aboard a train, strike up a conversation and hit it off really well. Ethan Hawke plays Jesse, an American finishing up a trip to Europe. He is aboard a train to Austria so he can catch a flight back home the next day. He plans on walking around Vienna all night since he has no money and nowhere to sleep. Julie Delpy plays Céline, a young French woman who is on the same train, though her destination is elsewhere. A couple arguing loudly in German prompts Céline to switch seats, finding new refuge as she sits near Jesse. This allows him to spark up a conversation with her. They talk about what they are doing on the train, their pasts, their thoughts about life and the future, and so fourth and so on. They both seem a bit hardened by life for such young people, but are jaded in different ways. Even though Jesse is leaving for America in the morning, Céline opts to get off the train with him in Austria so they can spend the evening together. Once the two are off the train, they walk around the city, taking in the local culture and continuing their conversations about whatever is on their mind at any given moment. They meet and talk to interesting characters and grow closer and closer, knowing it will all inevitably come to an end as the dawn breaks. This is a romance for romantic dreamers who travel the world hoping fate will lead them to the person of their dreams. It's both touching and beautiful to watch unfold, visually and emotionally, as we witness our characters seemingly fall in love with one another. However, there is also a level of cynicism to it all, knowing their short-lived romance has an inevitable end a mere 12 hours away. Still, as fanciful as it is, "Before Sunrise" somehow feels real, despite its bittersweet end. The dialogue within the conversations Jesse and Céline have contains enough thought provoking questions and metaphysical chatter to keep us invested in the film and characters. Despite it being a love story, it's not necessarily a common tale. The fleeting moments these two have together are nary wasted, and we are enthralled just to watch the sparks fly, from the slight graze of an arm to an intimate kiss or conversation, we know we're watching something special. It also helps that Ethan Hawke and Julie Delpy display excellent on screen chemistry despite their vast, worldly differences. This all happens against the gorgeous backdrop of Vienna, Austria, with its intricate buildings, its fascinating people, and its flare for romance. 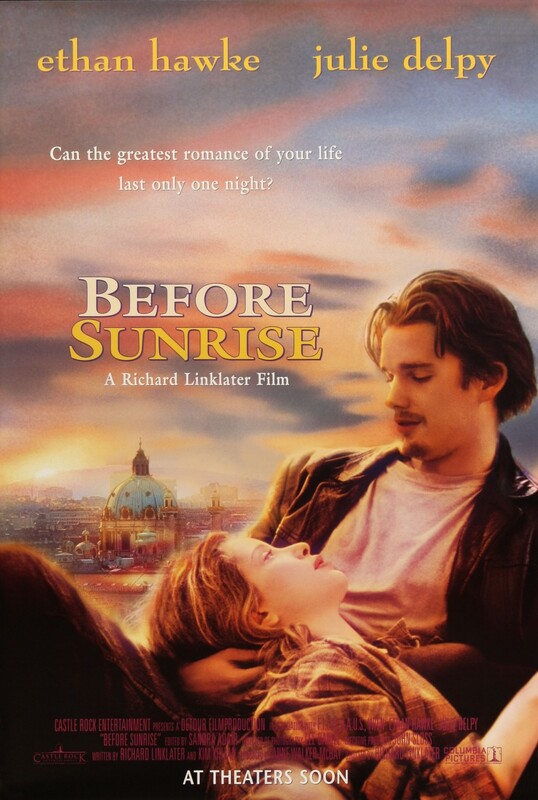 Overall, "Before Sunrise" is a very enjoyable film with great chemistry, good characters, a solid and sweet nature, with some interesting skepticism and some big questions about life, time, and above all, love. One year ago, we were watching: "Nowhere Boy"